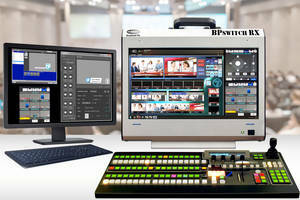 The BPswitch RX is a portable integrated production switcher from Broadcast Pix. It is housed in an aluminum alloy chassis and includes four multi-definition video inputs and two IP inputs supporting RTSP and NDI protocols. Featuring a 17-inch integrated touchscreen display, the production switcher offers various customizable control options. The BPswitch RX is built on a Windows 10 64-bit operating system and it also includes built-in production tools such as an audio mixer and three keyers with DVEs. Chelmsford, Mass. – Sept. 10, 2018 – Broadcast Pix™ will demonstrate a number of product upgrades and its new BPswitch™ RX portable integrated production switcher at IBC2018 (Hall 7, Stand C06), which runs Sept. 14-18 at RAI Amsterdam. Ideal for sports, concerts, and corporate events, BPswitch RX is ready for the road. Built on a Windows 10 64-bit OS and housed in a durable aluminum alloy chassis, the self-contained system includes four multi-definition video inputs, plus two IP inputs that support RTSP and NDI protocol. Built-in production tools include an audio mixer, three keyers with DVEs, program recording and live streaming to Facebook Live and other CDNs, clip and graphic stores, and NewBlueNTX multi-layer 3D motion graphics CG. BPswitch RX users can customize the BPview™ multi-view on the 17-inch integrated touchscreen display, or use the optional Broadcast Pix Commander™ customizable touchscreen interface for simplified control. The system also offers secure, browser-based control, including full-motion video and access to all sources and workflow tools, through Broadcast Pix’s BPNet™ IP ecosystem, which is powered through the ioGates cloud-based media management platform. Announced earlier this year, BPfusion is a software option for all BPswitch systems that integrates seamlessly with NewBlueNTX to automate the creation of data-intensive motion graphics. With simple drag-and-drop operation, the dual-channel BPfusion automatically integrates information into templates without re-keying the data from scoreboards, clocks, Twitter, RSS feeds, and other sources over IP. Originally designed for sports and election coverage, new enhancements to be introduced at IBC expand its use to information boards, tickers, and meeting coverage. The new playlist control allows users to create multiple playlists from elements in the Content Bin, so hundreds of pieces of content can be dynamically linked and updated. Plus, with BPfusion’s scene control, a looping information board can have a scene overlay, so a clock or bug overlay can be positioned over the content of the playlist. Upgrades to Version 7.5 software for BPswitch and Version 6.5 software for legacy systems will provide control of the Blackmagic Design HyperDeck Mini Ultra HD broadcast deck, as well as optional control for Blackmagic’s Videohub routers. The V. 7.5 upgrade will also allow Broadcast Pix Commander to open in a web browser, allowing secure remote logins through BPNet, and will eliminate Flash technology from its Soft Panel controls to improve security. The upgraded software will be available in October and is free for all BPswitch systems under warranty. Also available in October, the new ioGates Desktop App streamlines and customizes content delivery to specific devices to accommodate various workflows and format requirements. The free option makes it easy for clients to view and distribute large content files through its secure, cloud-based video management service. Once the app is installed on a server, laptop, or NLE workstation, clients can view, browse, and upload files within specific folders of an ioGates cloud account. Users can also customize how each client receives content to their device using ioGates cloud-based content conversion, so they always receive footage they can view.